Allen B. Boyer, Author of Suspicions at Sunset. 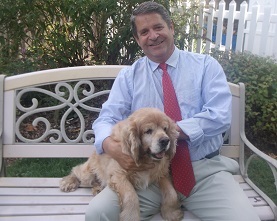 Today we are interviewing Allen B. Boyer about his new cozy mystery "Suspicions at Sunset," book 5 in the Bess Bullock Retirement Home Mystery series. I’m a husband and father of three young children. Writing success came early for me. I had three books published by a national publisher about ten years ago. My and wife and I also ended up having a child right around the time a book was released. Needless to say, I took a break from writing when my children were babies. Once they were older, I was able to get back to my writing. Cozy Cat Press took an interest in the Bess Bullock Series and we’ve both been happy with the success of the series. Describe the premise of your series, the Bess Bullock Retirement Home series. Something else that struck me was taking a character with a natural eye for people, curious behavior, and mystery and placing that character in a retirement home where they would have lots of idle time to watch the fellow residents and uncover little mysteries about them. Think Sherlock Holmes in a retirement home. What is the newest installment, "Suspicions at Sunset," about? The newest book begins on a train. Book 5 finds my main character returning home on a train from a trip to California for a funeral. While working her way through her grief, she decides to throw herself into observing her fellow passengers and finding little mysteries around their behavior. When she returns to her retirement home, she finds a few mysteries there too. One mystery involes a case of missing oxycodene, and the suspicion that a nurse is stealing it. From what I’ve read in the news, this seems to be a recurring problem in retirement homes. It’s unfortunate, but it did give me some inspiration. I’ve had contact with some readers who have had a loved one going into a retirement home and they’ve enjoyed the books because it gives them a positive view of life in a retirement home. I’ve also had feedback from readers who enjoyed the books because it features mysteries that don’t involve murder, violence, or gore. I was always interested in how Agatha Christie designed her novel, Murder on the Orient Express. The idea of setting an entire novel on a train appealed to me. I was about a third of the way through the book when my mother passed away. Her death really led me to think about the grieving process and how there are different levels of it and different ways of coping with it. That’s when the original idea for this novel changed. Tell us a bit about Bess Bullock and your inspiration for her character. Bess Bullock is a retired police officer. Her father was an officer, too. She’s a widow. She has one daughter. She had a son who died shortly after birth. 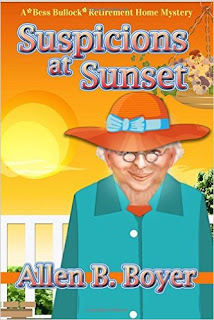 She moved to the Honey Hills Retirement Home with the greatest of intentions of embracing the idea of retirement. However, her instincts as a police officer simply refuse to retire, which leads her to some interesting mysteries involving fellow residents. The idea for a series came from visiting two special ladies in retirement homes. The first was my dear Aunt Mae, who simply charmed the socks off the nurses and other residents. The second was my wife’s grandmother, who read three books a week, took computer classes from a local college at the age of ninety and simply had the sharpest mind around. She also had a good eye for observing people and a curiosity about human nature. I thought it would be interesting to create a character out of these two ladies. As readers of my blog know, a writer that I’ve greatly admired is James Joyce. His use of language and description just amazes me. I have a collection of his short stories that I read from time to time for inspirtation. I’ve also enjoyed Alexander McCall Smith’s books. We are both authors who began with Young Adult book success before making the transition to writing mysteries for adults. I actually wrote him for some advice when I was looking for a publisher for Book One in this series. He was kind enough to write back with some words of wisdom. Of course, every author is different. For me, the process involves writing random scenes. I’ll have a general idea of what the theme of the novel will be, and in my head I’ll just start seeing random scenes that I’ll write down. When I have enough scenes, I’ll try to lace them together with a narrative to get the book going. Once this is done, I’ll have the first quarter or third of my book complete. After that, the scenes and the story start coming in a more linear fashion. I can only liken it to doing wind sprints before stepping up to the starting line to run a marathon. I can see more of a rhythm and flow to my writing in the midle and end of my stories when I read over them. It’s been interesting to experience. I had three books published about twelve years ago. Back then e-books weren’t as popular as they are now and most of the royalty checks I got were from print sales. Fast forward to when Book One of my series came out, and there are more e-books sold than print copies. It really has been amazing to see. I also like the function of the Kindle reports to track where the books are being sold. Being able to see books sold in England, Canada, and Japan is very satisfying to know. I’m the father of three young children, which means my writing time is very limited at this point in my life. In ten years, my hope is that they’ll be a bit more independent so I have more time to write. I’d like to continue to grow and develop as a writer. I think the first draft is the hardest for me. Getting to the finish line of a manuscript can be a challenge. Once I have a manuscript done from start to finish, the fun part comes in going back over the manuscript, making revisions and polishing passages. Tinkering with words to make them sound right is what I enjoy about the process. I’m currently working on a stand alone novel about two older sisters who are socialites in Washington D.C. I like the idea of using social connections to solve a mystery, rather than instinct. Right now I’m about a third of the way into the manuscript. I think there’s a lot of interesting mysteries about human nature and I like creating a character that explores that. The rhythmic sound of metal wheels tapping on train tracks was something Bess Bullock had grown accustomed to hearing during her trip. The tapping sound filled the air with the same recurring pattern both day and night. It had become as natural to her as the scenery out the window or the faces of the other passengers. Passing through the train car, she barely drew a glance from the other passengers. She could easily recall a time when she could catch the eye of any young man when she walked by. However, old age caused her blond hair to turn gray, her shapely legs to fill with blue veins, and her fashion tastes to become more sensible. While time had taken away her natural good looks, it had replaced her beauty with a less obvious gift; anonymity. It was a gift that Bess had grown fond of in how it helped her to observe people and investigate their curious behaviors. She watched the man in front of her maintain an easy pace, taking slow relaxed strides through one train car before moving into another one. Bess struggled to keep up. Occasionally, the train car would bounce or shift, causing her to grab hold of the nearest thing to maintain her balance. After one too many bounces her arthritic knee began to flare. She paused in an aisle. Her curiosity surged when she watched the man step ahead of her. The pain in her knee subsided and she continued to pursue him. Passing through two, three, four train cars, Bess kept up with the focus of her interest. She watched his every step and she began to think about how he was walking. Finally, the stranger lingered in one train car. This had seats facing long broad windows. The glass panes began on the sides of the car and extended up to the roof. This train car was clearly dedicated to those passengers enjoying the view. Bess watched the subject of her curiosity settle into a chair facing one of the windows that framed a vast open desert. She drew in her breath and walked up to her subject. She stopped next to an empty chair where the stranger was seated. Bess looked out the windows and took a moment to let her mind produce the right words to say. She studied him, noting his perfectly shined black shoes, his navy blue suit and how it accented his bright orange tie. He was clean-shaven. His dark hair was slicked back with some hair gel, giving him a sleek professional appearance. All of it, taken as a whole, was not that unusual. However, it was the subtle clues that made this man interesting to her. It was the mystery of his nuanced transformation that was drawing her to him.